Fennel is grown as an ornamental or a vegetable. 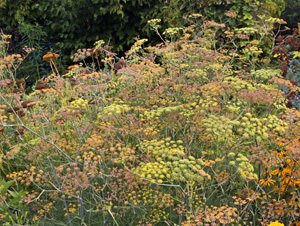 Fennel, Foeniculum vulgare, is a short-lived perennial with some types hardy in zones 4-9, but often grown as an annual in cooler climates. Native to southern Europe along the Mediterranean Sea, this plant in the carrot family (Apiaceae) has sweetly aromatic foliage and flavor similar to anise. Florence fennel, grown for the bulb. Fennel, anise and star anise all contain the aromatic compound anethole, which give these plants their similar taste and aroma. The biennial variety F. vulgare var. 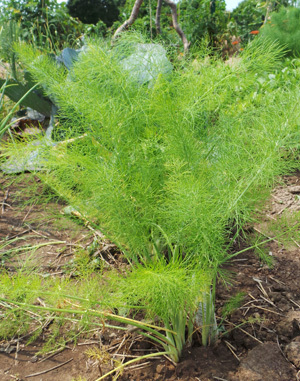 azoricum (sometimes incorrectly listed as F. vulgare dulce), Florence fennel or finocchio, usually grown as an annual, is smaller, with enlarged, flattened stem bases that form a bulbous structure that is eaten as a vegetable. Fennel leaves are very finely dissected, giving the foliage a very feathery appearance. Common fennel can grow up to 6 feet tall, but is often shorter than that. 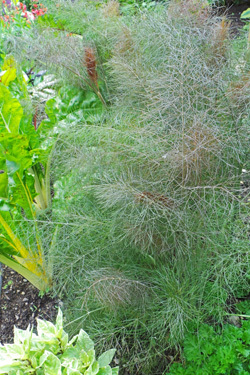 The smooth, dark green leaves are finely dissected with very narrow lobes, giving a feathery appearance to the foliage (similar to that of dill). Plants produce a deep, large white tap root. Fennel often does not bloom until its second year (in mild climates where it will survive the winter) but dry weather may promote bolting in first year plants. 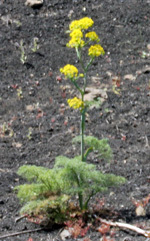 The small, bright yellow flowers are produced in a terminal compound umbel at the top of the smooth, jointed, hollow stems. Each umbel section has 20–50 flowers on short pedicels. The flowers are very attractive to many beneficial insects including bees, small wasps, lacewings, and syrphid flies, as well as butterflies. Plants bolt (L) to produce many compound umbels with yellow flowers (R). Fennel in flower (many past flower, going to seed). The seeds (botanically dry fruits) mature in the fall. Each elongate dark green to brown seed is ridged or grooved along its length. The seeds turn grey as they age. 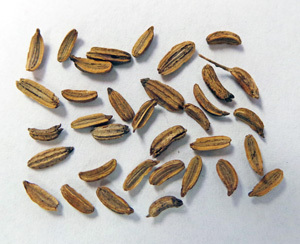 If seed is to be collected, the umbels should be cut as soon as they turn brown, before they shatter, and placed on screens or trays to complete drying. The seeds can then be collect when they fall from the stems. In mild climates fennel readily reseeds, naturalizes, and can become invasive there, but in cooler climates it rarely escapes cultivation. Deadhead the plants to prevent unwanted reseeding. Both the leaves and the stems are edible, with a light anise flavor. Fennel is a multipurpose plant, grown both for culinary and ornamental use. The leaves, tender young shoots, stems, and seeds are used in various cuisines for flavoring and food. The fresh leaves are often used to flavor fish, egg dishes, or salads and can be used to make a tea. The leaves do not retain their flavor when dried, however. 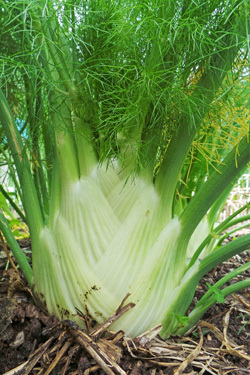 The young shoots or “bulb” (stem bases) of Florence fennel, which have a texture similar to celery, are eaten raw or cooked in salads or as a vegetable. The seeds are commonly used whole in Italian sausage and various pastries or confections. The ground seeds are a key ingredient of Chinese five-spice powder and Indian garam masala. 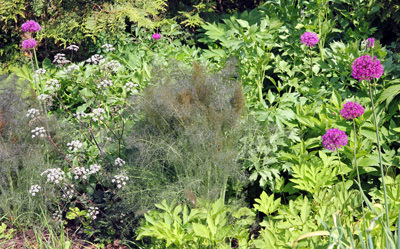 The fine texture of fennel contrasts well with other plants with coarser foliage. The ferny foliage and upright habit of the plant makes this plant attractive when mixed with annuals or other herbaceous perennials in a cottage garden or mixed border. Use it to fill in bare spots, or plant several together as a focal point. The tall common fennel makes a nice backdrop for shorter plants. Combine it with butterfly weed (Asclepias tuberosa), colorful gaillardia, or coneflowers. The flowers will create a color echo with goldenrod (Solidago spp.) and black-eyed Susans (Rudbeckia spp.). New foliage of Bronze fennel. 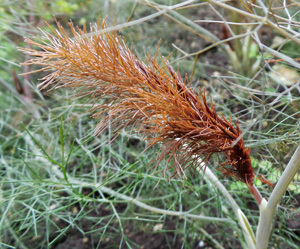 Bronze or copper fennel – cultivars with darker foliage, such as ‘Bronze’, ‘Giant Bronze’, ‘Purpureum’, or ‘Smokey’ – provide contrast in both color and foliar texture in ornamental plantings. The young foliage of these plants is purplish-bronze that fades to a dark green as it ages. 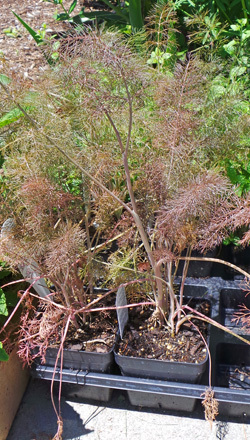 The deep brownish-gold color of bronze fennel looks great near silver-leaved plants, such as sages or lamb’s ears. Fennel can be grown in large containers, but typically does better in the ground because of its deep root. 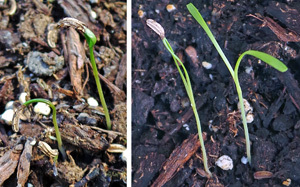 Fennel can be started from seed or bought as transplants. Plant fennel in full sun in well-drained soil. It can be grown from seed or started plants transplanted into the garden (although they don’t transplant particularly well because of the tap root). Soak seeds for a day or two for better germination. 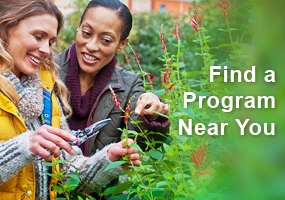 Sow seeds about ¼ inch deep after the last frost in spring, or in mid-summer for a fall crop of Florence fennel (spring-sown plants are more likely to bolt). They should germinate in 1-2 weeks. Thin to 4-6 inches apart when the plants are about 2 inches tall. In windy areas common fennel plants grown in rich soils may need staking, but often do not when grown in leaner soils so the plants do not grow as tall. Soil fertility affects flavor, as well, with less flavor in richer soil. Once established common fennel is drought tolerant. Fennel does best in full sun. Florence fennel does better in richer soils with more moisture than common fennel needs. The bulbs can be blanched by mounding soil up around the base as the enlarged part develops. The largest bulbs develop in warm, sunny, moist summers. 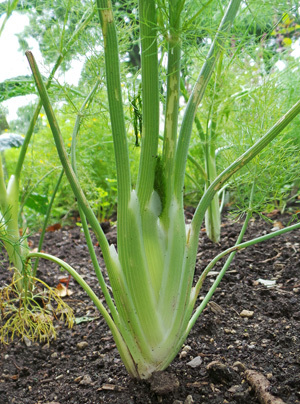 Keep Florence fennel evenly moist, as dry conditions will promote blooming, which ruins the bulb. The bulb should be harvested once it is about the size of a tennis ball, before bolting. Add fennel to mixed ornamental beds or in a vegetable or herb garden. Fennel will tolerate light frost, so it does not need to be harvested early for summer-sown crops. Cut the “bulb” at the base and shoots may resprout from the root; these can be eaten while small. Fennel has few pest problems other than root rot in very wet soils, but it is a host plant for anise swallowtail and black swallowtail caterpillars (especially the bronze types). 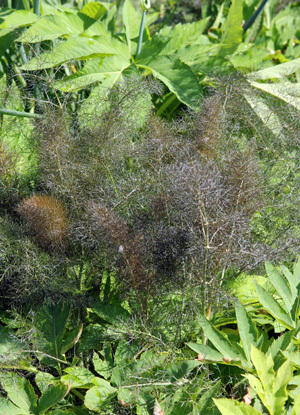 It will cross-pollinate with dill, which creates and undesirable flavor in the seeds. 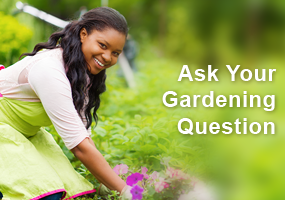 The plant sap can cause skin irritation in sensitive individuals, especially when exposed to sun. Ferula linkii, a relative of giant fennel, on the island of Lanzarote. ‘Cantino’ – bolt-resistant variety, so good for early planting. Giant fennel (Ferula communis), also native to the Mediterranean, is a much large, coarser plant, with a pungent aroma and is not edible. 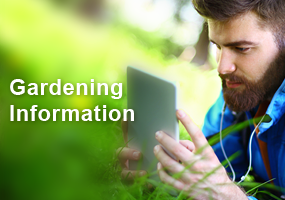 It is only occasionally grown in gardens.